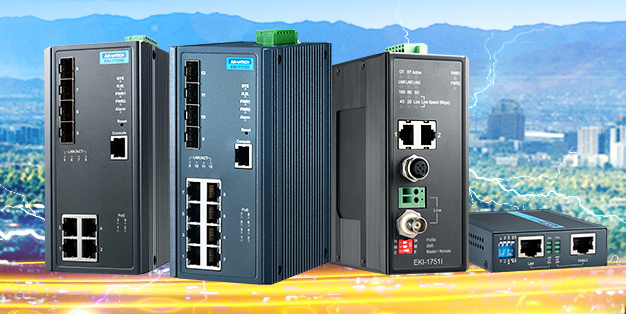 Thanks to new Ethernet extenders from B+B SmartWorx powered by Advantech, upgrading and implementing Ethernet networks with extended distance and upgraded power capability is no longer a labor intensive, time-consuming and expensive project. B+B SmartWorx has released several new Ethernet Extender models. The most compact and affordable solution, EKI-1751-AE, utilizes copper wire to extend Ethernet beyond its 100 meter limitation. It allows users to upgrade to a more industrial design that not only extends the Ethernet network over copper wire, but also can extend the network over coaxial cable. New model EKI-1751I-AE includes ruggedized specifications for wide -40°C to 75°C temperature range, DIN rail mounting and dual 12 to 48VDC power inputs for redundancy. Additionally, two more models include the capability to remotely power end devices by Power over Ethernet (PoE). Models EKI-1751PI-M-AE and EKI-1751-PI-R-AE have the same benefits of the industrial EKI-1751I-AE, but also include additional Ethernet ports so more devices can be connected at each end without adding Ethernet switches. In addition to providing PoE power to end Ethernet devices, the master unit can also provide power to the remote extender by Power over VDSL (PoVDSL). PoVDSL help with cost savings as users don’t have to call an electrician out to run a new power circuit. With the PoE/PoVDSL combination, users can remotely power high-bandwidth devices without having to sacrifice budget. B+B SmartWorx EKI-1751 Ethernet extenders are simple to setup and deploy; a dip switch is used to configure features, such as unit selection for local or remote device and profile settings. Each extender is equipped with diagnostic LEDs that indicate power, speed, link and other activity status. Extending Ethernet for hard-to-reach power sub meters in retail applications.